If you’re feeling short on time, you’re not alone. In 2014, Content Marketing Institute and MarketingProfs released a report noting that 69 percent of B2B marketers and 57 percent of B2C marketers share the same challenge of their job: lack of time. Technology connects everyone online. It’s the reason content marketing is so powerful. But connecting with everyone also creates time-constrained projects. From managerial requests to constant social updates, your attention is stretched in several directions. According to Jesper Termansen, CMO of Templafy, “From businesses to individual consumers, everyone is connected to everyone, everywhere, all the time,” No wonder content marketers feel overwhelmed. But imagine another scenario, one where you have the time to focus on more important tasks. You could increase the quality of your work and develop more creative solutions to tough problems. You’d be more energized and less stressed. Well, it’s not a fantasy! Reclaim your content marketing schedule. Start by prioritizing productivity. Try these three strategies. Not every tactic will drive results for your business. Yet, many content marketers pile on new idea after new idea. Ineffective strategies are productivity killers. To make the best use of your time, identify which techniques work. Analyze your traffic reports, social media performance, and lead generation charts. But before jumping into your data, remember that your metrics must align with your business goals. Which metrics best define what you want to achieve from your content? From page views to social shares, there are multiple ways to measure user engagement. For example, if your content is a lead generation tool, then conversions may be your top metric. Each metric helps you understand your visitors’ interactions with your content. However, trying to keep track of all that data can be a second job. Analytics dashboards help track content performance. Use tools like Scoop.it Content Director, Google Analytics, SessionCam, or Mixpanel, to monitor your goals. You’ll know exactly which content categories are driving results and which aren’t. Don’t get stuck doing meaningless tasks. Focus on the strategies that work. Analytics can save you time. Great content takes a lot of time and effort to produce. It’s a shame to give it only one brief moment of publication glory, and then bury the content in your archives. That’s why nearly 30 percent of top marketers use a systematic strategy to recycle their existing content. It’s time to revive your old content. Begin by developing timeless, evergreen content for your readers. Those are topics that will always be a pain point for your readers. And the only thing that may change is the solution. So, use that as an opportunity to update the post with new information. “The main thing to keep in mind here is every single time you create a piece of content, come up with a game plan on how you could get the most value possible,” says Sara Jantsch, Director of Community at Duct Tape Marketing. 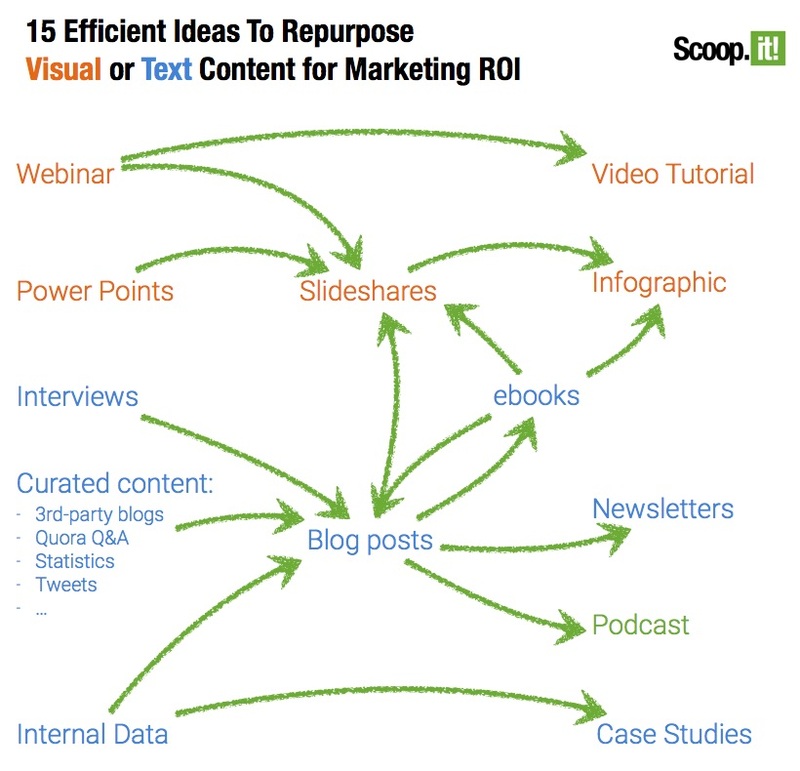 Reusing and repurposing content can help you make the most of your time. Try using this strategy on your most popular posts. Guest posts can build your audience and save you time. It’s an effective way to add fresh concepts to your content. Moreover, you will build working relationships with other writers or content marketers in your industry. Many well-known blogs have used guest posting. For instance, Kissmetrics gained an audience of more than 400,000 people per month using mostly guest author contributions. But be wary. Not all guest contributions will meet your standards. Dealing with a high volume of poor content can take as much time as producing content yourself. To combat poor guest post submissions, develop a few writing guidelines. This will keep you sane and add efficiency to your guest posting process. Screen potential guest bloggers before accepting a contribution. What have they written recently, and where? Is it exceptional? Is their style appropriate for your blog? Follow your instincts; if you aren’t excited by the writer, then respectfully decline. Create a contributor guidelines document. This document should establish what you will and will not accept. You can suggest word counts, topics, and required assets, like images or citations. Be sure to describe your brand and audience, too. Ask the writer to pitch a few topics. Then, select your favorite or suggest your own. Approving a topic in advance makes it more likely that the writer will provide a draft that fits your readers’ needs. Check for plagiarism. Use a tool, like Copyscape, to ensure the post was not published anywhere else. For many content marketers, it’s content creation that takes the most time. If that describes you, take advantage of a guest post strategy to fill in your content calendar. Don’t get frustrated with your lack of time. Instead, find ways to be more productive. Focus on content strategies that produce results. Repurpose your best work. And leverage quality guest posts to regain time in your schedule. Focus on what matters most. Be productive. 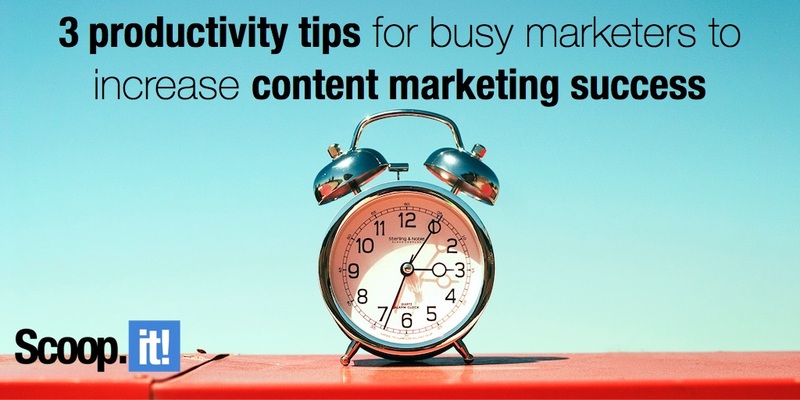 Have productivity tips that have helped you save time as a content marketer? Share them in the comments below! 1 Comment on "3 productivity tips for busy marketers to increase content marketing success"
Great Article. 2 and 3 are great points. I have so much content now that I can turn one article in twenty using different social sites like Digital doughnut, LinkedIn, and more. I just make sure they all have my links on them. Write it once and copy and paste. Then I always love constructive criticism. It have changed by blog at least six times overs the last year and a half based one visitors opinions.